The PHARMACOP-intervention significantly improved medication adherence and inhalation technique for patients with COPD compared with usual care. This study aimed to evaluate its cost-effectiveness. An economic analysis was performed from the Belgian healthcare payer’s perspective. A Markov model was constructed in which a representative group of patients with COPD (mean age of 70 years, 66% male, 43% current smokers and mean Forced Expiratory Volume in 1 second of % predicted of 50), was followed for either receiving the 3-month PHARMACOP-intervention or usual care. Three types of costs were calculated: intervention costs, medication costs and exacerbation costs. Outcome measures included the number of hospital-treated exacerbations, cost per prevented hospital-treated exacerbation and cost per Quality Adjusted Life-Year. Follow-up was 1 year in the basecase analysis. Sensitivity and scenario analyses (including long-term follow-up) were performed to assess uncertainty. In the basecase analysis, the average overall costs per patient for the PHARMACOP-intervention and usual care were €2,221 and €2,448, respectively within the 1-year time horizon. This reflects cost savings of €227 for the PHARMACOP-intervention. The PHARMACOP-intervention resulted in the prevention of 0.07 hospital-treated exacerbations per patient (0.177 for PHARMACOP versus 0.244 for usual care). Results showed robust cost-savings in various sensitivity analyses. Optimization of current pharmacotherapy (e.g. close monitoring of inhalation technique and medication adherence) has been shown to be cost-saving and should be considered before adding new therapies. Chronic Obstructive Pulmonary Disease (COPD) involves a high burden on morbidity, mortality as well as healthcare and societal costs [1, 2]. In Belgium, between 5.5% (population aged 55 years) and 9.5% (population aged 75 years) of the population is suffering from COPD . Although COPD is known by its progressive character, disease symptoms can be well managed through proper medications and optimal disease management. For this purpose, the Global Initiative for Chronic Obstructive Lung Disease (GOLD) guidelines recommend close monitoring of patients’ pharmacotherapy, including medication adherence and inhalation technique . Both adherence and inhalation techniques have been shown to be suboptimal in patients with COPD . Moreover, suboptimal adherence and inhalation mishandling are significantly associated with worsened clinical, humanistic and economic outcomes [6, 7]. Several intervention programs have been developed to improve disease management, of which multidisciplinary collaborations to provide integrated care have been shown to be particularly effective . In recent years, community pharmacists are being increasingly involved in COPD management [5, 9, 10]. Due to their periodical patient contacts upon prescription refills and their specific knowledge on the (inter)acting and administration of medication, community pharmacies offer a promising platform for optimization of medication adherence and inhalation techniques of patients with COPD. The 3-month PHARMACOP-intervention (PHARMAceutical Care for COPD, N = 734), conducted in 170 community pharmacies in Belgium, significantly improved both medication adherence and patients’ inhalation technique . 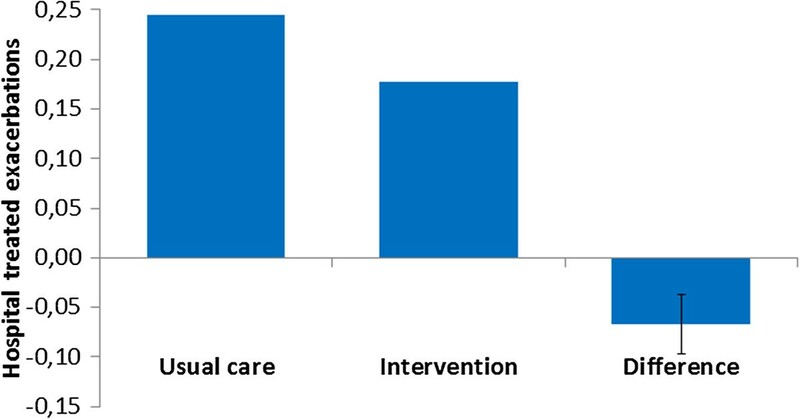 In addition, significantly lower hospitalization rates were observed in the intervention group as compared to the usual care group. In times of increasing healthcare costs and higher demands, economic analyses of healthcare interventions are becoming of increasing importance to achieve a fair allocation of scarce healthcare resources. 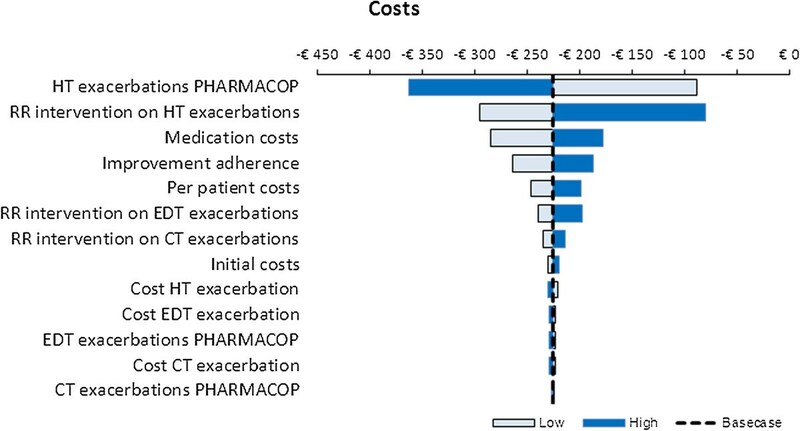 Cost-effectiveness of several COPD disease management programs have been studied before [12, 13]. A recent meta-analysis showed that such programs can lead to significant savings in hospital costs and total healthcare costs . However, economic analyses of COPD programs primarily focusing on medication adherence and inhalation technique are limited and therefore recommended . This study aimed to assess the cost-effectiveness of the PHARMACOP community pharmacists’ COPD intervention program. We performed a cost effectiveness analysis of the PHARMACOP-study . Details of the original randomized controlled trial and the methods related to the cost-effectiveness analysis are described in the following sub-sections. The PHARMACOP-study was a 3-month randomized controlled trial (N = 734) carried out between December 2010 and July 2011 in 170 community pharmacies throughout Belgium. Interventions focused on improving medication adherence and inhalation technique. Results showed that inhalation scores were significantly improved with 13.5% (95%CI: 10.8-16.1; P < 0.0001). Medication adherence, as measured by the medication refill adherence (MRA) , was significantly improved from 85.70% to 94.21% (difference: 8.51%, 95%CI: 4.63-12.4; P < 0.0001). In the intervention group a significantly lower hospitalization rate was observed (9 vs 35; Rate ratio: 0.28, 95%CI: 0.12-0.64; P = 0.003). No other significant differences were observed. A summary of the PHARMACOP-study is provided in Additional file 1 and the complete description of the study protocol and its results can be found elsewhere . The cost-effectiveness analysis was performed according to the Belgian guidelines for pharmacoeconomic research. The PHARMACOP-trial followed patients for up to 3 months. However, as some costs and effects resulting from the intervention are expected to occur after this period, a Markov model was constructed to be able to capture long-term costs and effects of the PHARMACOP-intervention. Markov models have often been used in health economic evaluations of COPD interventions [17, 18] and are a recommended approach to increase external validity and to allow for long-term follow-up [19, 20]. Details of the model are described in the following part. The analysis was performed from a healthcare payer’s perspective, in line with the recommendations from the Belgian guidelines for pharmacoeconomic research . This means that the analysis included only direct healthcare costs, such as primary care, hospital care and medications; i.e. public payments as well as co-payments by the patient (in Belgium known as “remgeld”). No indirect costs (of productivity losses) were included. In the model (Figure 1), a hypothetical group of patients with COPD was followed either receiving the PHARMACOP-intervention or usual care. The model population, with a start age of 70 years, 66% male and 43% current smokers, was an accurate reflection of the population participating in the PHARMACOP-trial . Moreover, the community pharmacy population is considered representative for the COPD population in Belgium as all patients, disregarding insurance or disease severity, are refilling their prescriptions in community pharmacies. Markov model to follow patients with COPD in time. ED: Emergency Department; FEV1% pred: percentage of the predicted Forced Expiratory Volume in 1 second. Because the trial did not collect any measures related to patients’ spirometric functions we assumed a truncated (at 0 and 100%) normal distribution of Forced Expiratory Volume in 1 second (FEV1% predicted) with a mean of 50% and a standard deviation of 19.9 to obtain a severity distribution with 16% of patients in the very severe, 34% in severe, 43% in moderate and 7% in mild COPD state. This assumption was based on characteristics from the PHARMACOP-study: Patients were included in the PHARMACOP-study if they used at least one type of long-acting drug, indicating a disease state worse than GOLD 1 . In addition, mean COPD Assessment Test (CAT) score of patients in the PHARMACOP-trial was 16.5 (see Additional file 1), indicating marked symptoms . The impact of this arbitrary mean percentage of FEV1% predicted was investigated in sensitivity analyses. A Markov model was constructed in Microsoft® Excel 2010. In line with the length of the PHARMACOP-trial, the cycle length of the model was 3 months. In the first 3 months, patients started in the ‘PHARMACOP phase’ in which trial effects were directly projected at the model population. For validation purposes, after running the first cycle, results were compared to the results of the PHARMACOP-trial (Additional file 2). In the follow-up of the model (after the first cycle of three months), patients could move between five disease states: mild, moderate, severe, very severe and death (Figure 1) in line with the GOLD spirometric classifications . Model input and rationale are described in the following section and summarized in Table 1. CI: Confidence Interval; €: 2013 euros; ED: Emergency Department; RR: Relative Risk. Transition between disease states was based on the annual decline in the mean FEV1% predicted. In each cycle, a basic decline in FEV1% predicted was modeled depending on age, gender and smoking status. The annual decline was based on a previously published regression model  that was fitted to longitudinal data from the Lung Health Study . We assumed that the PHARMACOP-intervention did not affect decline in FEV1% predicted. The PHARMACOP-trial did not report any effects on mortality. Therefore, in order to obtain estimates of the size of the COPD cohort in time, Belgian age-depended COPD and all-cause mortality was modeled and no effects of the PHARMACOP-intervention were assumed . Mortality due to exacerbations was not modeled. During each cycle, patients had a chance of three different kinds of exacerbations to occur: those that were community-treated only, those that led to an Emergency Department (ED) visit and those that led to hospitalization. In the control group, exacerbation rates from the PHARMACOP control group were applied in the first three months (Table 1) and after three months exacerbation rates from a meta-analysis were applied . In the intervention group, these exacerbation rates were multiplied by the effects (relative risks; RR) from the PHARMACOP-intervention on all three types of exacerbations (Table 1). In the basecase this effect lasted only for the first three months, in line with the follow-up of PHARMACOP. In sensitivity analyses, effects that lasted for 1, 5 and 12.5 years were also analyzed. In these long-term projections linear extrapolation of the intervention effects was applied. All costs were expressed in 2013 euros. Three types of costs were calculated: intervention costs, medication costs and exacerbation costs. Intervention costs included a fixed initial fee for training of the pharmacists and written materials (estimated at €10,000) and a per-patient fee. The fixed intervention costs were divided by 363 patients to obtain the costs per patient. The per-patient fee was based on the average time investment for the two face-to-face counseling sessions (mean total time: 38 minutes, SD: 21 minutes) provided in the 3-months of the PHARMACOP-trial, multiplied by the pharmacist’s salary, resulting in an estimated per-patient fee of approximately €50 (including employers premiums) per 3 months. 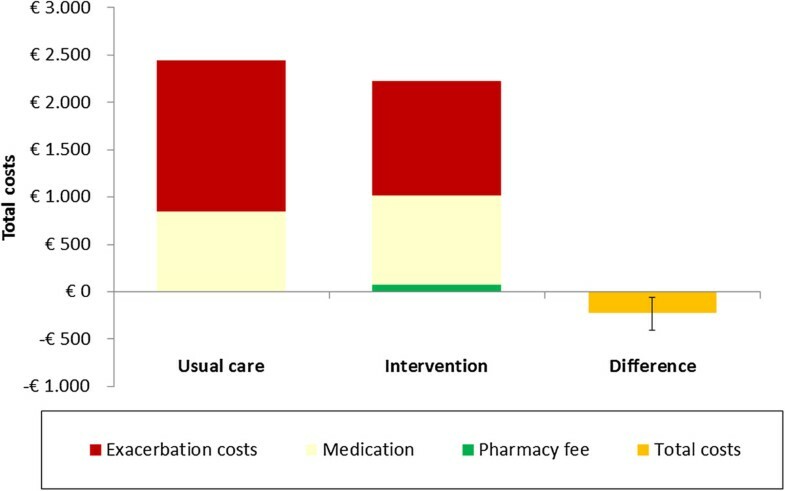 Medication costs in the usual care group and the intervention group were calculated as the yearly costs of medications used in the PHARMACOP-trial when all medication would be used as prescribed (=100% adherence), multiplied by the actual ‘usual care group’ adherence (85.70%) or the ‘intervention group’ adherence (94.21%), respectively. Exacerbation costs were calculated as the product of the number of exacerbations (community, ED or hospital-treated) and the price per unit (Table 1). Each COPD disease state was assigned a preference-based health-related quality of life value (a utility) . In addition, a percentage of utility decrement from baseline was modeled if an exacerbation occurred (Table 1). Notably, the PHARMACOP-intervention showed no significant effects on quality of life as measured by the EQ-5D, a result that might be related to the timing of the pre-scheduled pharmacy-visits for measurement of health status and the relatively short duration of exacerbations . Therefore, as an conservative approach, no direct effects on quality of life were applied in the intervention group and utility values were solely based on disease state and the occurrence of exacerbations. Consequently, Quality Adjusted Life Years (QALY) gains due to the PHARMACOP-intervention only result from a reduction in exacerbations. The time horizon in the basecase analysis was 1 year. This time horizon was chosen to align with budgetary timeframes from (Belgian) health insurance companies. However, as effects from the interventions may impact on the long-term, costs and effects using longer-term follow-up (up to 12.5 years) were assessed in sensitivity analyses. Effects on medication adherence (and related medication costs) were assumed to last for 1 year after the program ended, based on delayed effects on adherence shown in previous studies . After 1 year, adherence went back to baseline adherence (85.7%). To address parameter, structural and methodological uncertainty, both univariate and probabilistic sensitivity analyses were performed. To show individual influence of the parameters, all relevant parameters were varied within their 95% confidence intervals (95%CI) and outcomes were presented in a tornado diagram showing the most influential parameters on top of the graph. In probabilistic sensitivity analyses (3,000 iterations, using Monte Carlo simulations), all relevant parameters were varied primarily based on pre-specified statistic distributions as shown in Table 1. The distribution for medication costs was fitted (best fit selected using Akaike Information Criterion) as patient-level data were available. Results of the probabilistic sensitivity analyses were presented in a cost-effectiveness plane. In scenario analyses the influence of different time horizons, long lasting effects of improved adherence and different program runtimes on cost-effectiveness were assessed. Sensitivity analyses were performed for alternative follow-up periods of respectively 0.5 year, 2, 5, 10 and 12.5 years. In long-term follow-up, all future costs and benefits (after 1 year) were discounted according to the Belgian pharmacoeconomic guidelines; costs at a rate of 3.0% and effects at a rate of 1.5% . The total costs per patient for intervention and usual care were €2,221 and €2,448, respectively within the 1-year time horizon in the basecase (Figure 2). This reflects a cost saving of €227 (95%CI: €58-€403) per patient for the PHARMACOP-intervention. Also, the PHARMACOP-intervention resulted in a significant decrease of 0.07 (95%CI: 0.04-0.10) hospital-treated exacerbations per patient (0.177 for PHARMACOP versus 0.244 for usual care) when the intervention effect was applied for the first 3-months (Figure 3). In addition, a small (<0.001 QALYs) increase in QALYs gain was observed. 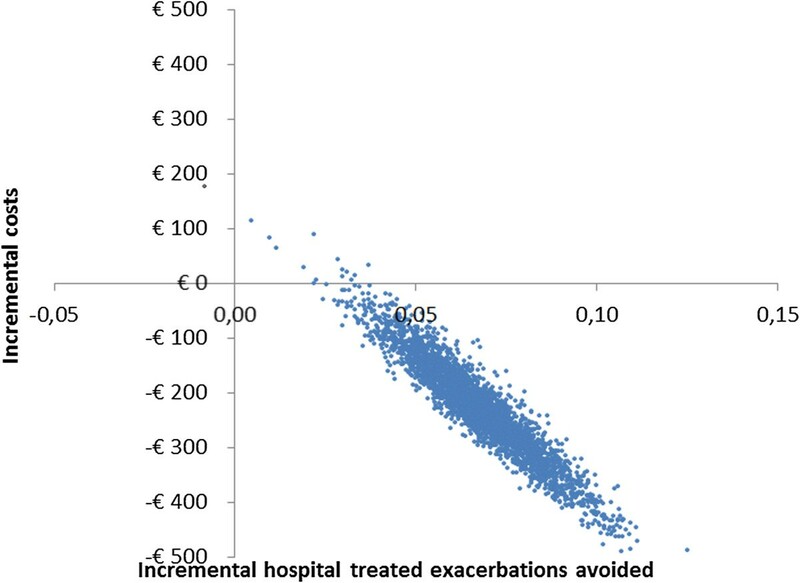 Notably, the initial higher costs in the PHARMACOP-intervention (due to intervention costs and increased adherence) compared to usual care of €161 per patient were offset by €388 savings on expenses for treatment of exacerbations. Summary of 1-year effects on costs. Usual care: Medication costs (850), Pharmacy fee (0), Exacerbation costs (1598), Total costs (2448); Intervention: Medication costs (934), Pharmacy fee (77), Exacerbation costs (1210), Total costs (2221); Difference (95% CI): Medication costs (84; 44-129), Pharmacy fee (77; 55-104), Exacerbation costs (-388; -225 - -560), Total costs (-227; -58 - -403). Summary of 1-year effects on hospital-treated exacerbations. Usual care: Hospital Treated (HT) Exacerbations (0.24). Intervention: Hospital Treated (HT) Exacerbations (0.18). Difference (95% CI): Hospital Treated (HT) Exacerbations (-0.07; -0.04 - -0.10). Probabilistic sensitivity analyses revealed that >99% of the 3,000 simulations performed resulted in cost-savings for the PHARMACOP-intervention, often combined with positive incremental effects on both QALYs and hospital-treated exacerbations. This is illustrated in Figures 4 and 5: The majority of the simulations were situated in the South-Eastern quadrant of the cost-effectiveness plane. 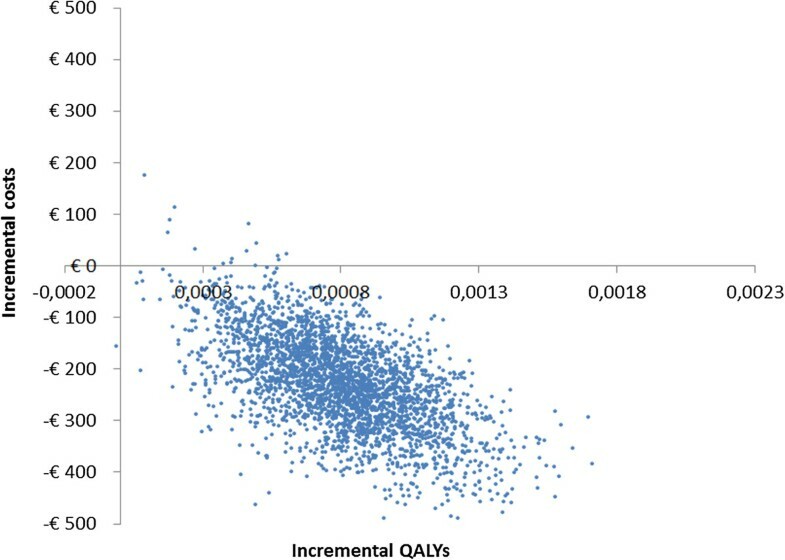 At a willingness to pay of €0 per QALY, the probability of the PHARMACOP-intervention being cost-effective was 99.4%.In univariate sensitivity analyses, all relevant parameters were varied within their 95%CI of the basecase values. Figure 6 shows the model was most sensitive to the number of hospital-treated exacerbations in the PHARMACOP-trial and the relative risk reduction due to the intervention. The medication costs and adherence improvement were of somewhat less influence. However, the dominant situation of the PHARMACOP-intervention was retained in all univariate analyses. Probabilistic sensitivity analyses for QALYs. QALY: Quality Adjusted Life-Year. Probabilistic sensitivity analyses for hospital-treated exacerbations. Univariate sensitivity analyses. CT: Community Treated; EDT: Emergency Department Treated; HT: Hospital Treated; RR: Relative Risk. In scenario analyses (Table 2) several variations of the intervention runtime, the time the adherence improvement would last, extensions of the time horizon and mean FEV1%pred were tested for their influence on cost-effectiveness. As no marked QALY differences were observed, this scenario analyses included costs and hospital-treated exacerbations only. The PHARMACOP-intervention remained cost-saving with longer projected time horizons and different assumptions on the lasting effect on adherence. If the program runtime was as long as the time horizon, up to 1.36 hospital-treated exacerbations per patient were prevented in the 12.5 year time horizon. Cost savings were retained in most sensitivity analyses, except for the scenario where costs due to adherence improvement lasted for 12.5 years. Although the mean FEV1% pred did affect absolute number of hospital-treated exacerbations, the number of prevented hospital-treated exacerbations remained the same. Our aim was to assess the cost-effectiveness of the PHARMACOP community pharmacists’ COPD intervention program. In a 1-year time horizon, the PHARMACOP-intervention would induce a cost saving of €227 per patient, compared to usual care. This was primarily the result of the prevention of 0.07 hospital-treated exacerbations per patient. Therefore, the results of this cost-effectiveness analysis indicate that the PHARMACOP-intervention provides more value for money, combined with increased health gains when compared to usual care, i.e. it is the dominant strategy. Furthermore, long-term projections revealed that when the intervention would be extended to longer periods (up to 12.5 years), a considerable amount of 1.36 hospital-treated exacerbations per patient would be prevented. As we assumed a linear extrapolation of effects, long-term clinical follow-up is necessary to confirm whether this assumption does reflect real-life effectiveness. Accordingly, Khdour et al. reported a pharmacist’s intervention as highly cost-effective with both savings on total costs and gains in effects . Takemura et al. did not report costs but observed comparable effects on adherence and exacerbation rates . Notably, effects of these adherence enhancing interventions are considerable, especially when compared to reduction of exacerbations observed in trials assessing the effectiveness of (new) medication. This may be explained by the possibility that these type of behavior modifying interventions not just alter patients medication adherence but alter healthy behavior as a whole (i.e. “healthy adherer effect” ), resulting in a much larger effect. A posthoc analysis from the TORCH-trial  illustrates this explanation: patients with high adherence (regardless of whether the patients used medication or placebo) showed marked better outcomes (rate ratio severe exacerbations: 0.58) compared to patients with lower adherence. Moreover, regarding the percentage of patients with >1 exacerbations in the previous year, this was only 33% in the TORCH-trial, while in PHARMACOP this was 54%. As the ECLIPSE-study showed that a higher number of exacerbations in the previous year indicated a higher baseline risk for new exacerbations , more exacerbations could be expected in the PHARMACOP-population, thus larger potential gains. This aligns with the explanation regarding differences in effectiveness of COPD self-management interventions of which some showed positive and some showed disappointing results, depending on the baseline characteristics of the population . While the PHARMACOP-intervention prevented a considerable amount of hospital-treated exacerbations, only little gains on quality of life measures were observed. This as well corresponds with results from a COPD intervention program that focused on adherence . This finding is explained by the discrepancy between the timing of measurement of health status within trials and the relatively short duration of exacerbations . When comparing the hospital-treated exacerbation rate (0.38 per patient-year) of the PHARMACOP-population to large trials, the rate seems relatively high. For example, in the TORCH-trial the hospitalization rate was 0.2 (SD:0.6) per year  and in the UPLIFT-trial 0.15 (SD 0.01) . However, hospitalization rates highly depend on type of study and are reported to vary from as low as 0.09 to 2.4 per year . Since co-morbidities such as heart failure increase the risk of hospital treated exacerbations in patients with COPD, and since several co-morbidities are excluded in classical RCTs of COPD (such as TORCH and UPLIFT), the different prevalences of co-morbidities might (partially) explain the higher exacerbation rate in the real-world PHARMACOP-study. Another risk factor for a high exacerbation rate was the winter season in which the trial was performed . In addition, mean CAT score in the PHARMACOP-population was >10, indicating patients with high symptoms according to the new GOLD guidelines . When compared to a previous Belgian cost-effectiveness report in the evaluation of tiotropium, hospitalization rates are more in line (0.36 per year) , what might suggest that patients in Belgium are relatively earlier referred to hospital when exacerbations are suspected. This study is the first cost-effectiveness analysis of an intervention directed at improving COPD patients’ medication adherence and inhalation technique based on a large RCT. One of the major strengths of this trial was the community care setting in which real-life data were obtained. The vast majority of patients with COPD fill their prescriptions in community pharmacies, where recruitment took place. Our study population - and therefore also the results from the current cost-effectiveness study - is considered representative for the Belgian COPD population using inhaled medication for the maintenance treatment of COPD. The study closely followed and modeled real-life medication distributions among the study population. Using this distribution enabled precise estimates of the economic impact of improving medication adherence for the total population. Therefore, not only the costs for the intervention itself (materials and time of healthcare providers) but also costs related to the extent of medication use, which effects may last for longer periods, were included providing a complete economic picture. Finally, the analysis was reported according to the CHEERS-guidelines for reporting of health-economic evaluations . Though basecase assumptions were well-considered and assessed for robustness in sensitivity analyses, long-term effects related to the programs’ future impact on frequency of (severe) exacerbations and costs, remain highly uncertain. Some studies recommend that inhalation instruction should be (frequently) reinforced for continuation of optimal pharmacological effects [43, 44]. Also future changes in healthcare policies and treatments may change current cost-effectiveness estimates. Regarding implementation in the Belgian healthcare system, the varying ability of individual healthcare providers to adopt - and patients to respond to - the interventions has to be considered, which limits generalizability. Regarding generalizability to other countries, differences in country specific healthcare systems, costs and regulations should be taken into account. For example, this study did not take into account indirect costs (productivity), in line with Belgian guidelines, while the Dutch guidelines recommend to take these costs into account indeed . Long-term projections of our COPD model should be interpreted with caution as e.g. in spite of evidence that decline in lung function is increased by the occurrence of an exacerbation we did not account for this possibility . However, because this decline due to an exacerbation is relatively low in comparison with regular annual lung function decline, for analyses up to 2 years (including the basecase analyses) this is considered only a minor limitation. As an alternative to addition of new drugs to COPD patients’ treatment regimen, optimization of current treatment has to be considered. Pharmaceutical care (i.e. optimization of medication adherence and inhalation technique) as provided by the PHARMACOP-protocol should be embedded in the integral multidisciplinary respiratory care for patients with COPD. Based on the cost-saving strategy, health insurance companies should be stimulated to reimburse these type of interventions. Furthermore, community pharmacists are well positioned - and are recommended - to integrate COPD specific pharmaceutical care as part of their daily practices. Overall, these recommendations are expected to contribute to better patients outcomes and to lower total healthcare costs for the COPD population. In particular, when interventions are performed in the winter season, the season when patients are at highest risk for exacerbations, potential health and cost gains are maximized. In the current cost-effectiveness study of the PHARMACOP-trial, we demonstrate that improving inhaler adherence in community pharmacies is a cost-saving strategy compared with usual care. Before adding new therapies, the optimization of current treatment options has to be considered. Community pharmacies offer a cost-effective platform for improving medication adherence, inhalation technique and outcomes in patients with COPD and these activities should be embedded in the integral multidisciplinary respiratory care for patients with COPD. JB, ET, KB, EM, SV and GB declare that they have no competing interests, regarding the submitted work. MP reports grants, personal fees and non-financial support from various pharmaceutical companies, outside the submitted work. The Erasmus University, Institute for Medical Technology Assessment, where MR is employed, has received funding for designing and conducting cost-effectiveness studies of COPD drugs from multiple pharmaceutical companies (Boehringer Ingelheim, Nycomed, Pfizer). MR has received speaker fees and compensation for serving on advisory boards for GSK, Boehringer Ingelheim, Pfizer, Nycomed and Novartis. MR does not own stock of any pharmaceutical company. JB, SV, MR and MP designed the research. JB and SV performed the analyses. ET, KB, EM, MR and GB provided input for the analyses. All authors interpreted the data. JB and ET wrote the paper. All authors commented on the first draft. All authors read and approved the final version of the manuscript.